Truth be told, I've never been a Breitling fan. I've even know to have scoffed at the brand in the past. I've always find Breitling to be too fuddy-duddy. Too traditional and unnecessarily busy looking. For years I've wondered if the design team at Breitling comprises of the same people since... time eternal??? Are they made up of a bunch of old fogies, still dressed in their tweeds and take twenty minutes to scale a flight of stairs? What don't I like about Breitling's design? The list is almost inexhaustive. Firstly, the dial is always too damn busy. And somehow, the design gurus at HQ are able to extend that complicated mass onto the bezel and even the bracelet. I've never been a fan of their bracelet. It's too bling, too shiny and even if they are matte, it's just too busy looking. too many links. and why must they be slanted? It doesn't gel with the serious looking case and dial. Oh, and busy bracelet. Speaking of the bracelet, I've never had a good experience with their bracelet. Ok, well, it's more my fault then theirs. It's mine own fault that I have a hairy wrist. Yes, you guessed it, the bracelet behaves like a medieval torture device, happily plucking the hair on my wrist. Breitling's designs seem to have stood still. Oops! I meant design, singular, as most of their offerings seem to be a variant of one another. They remind me of Volvo up till the early-mid 90's. Their designs never changed. 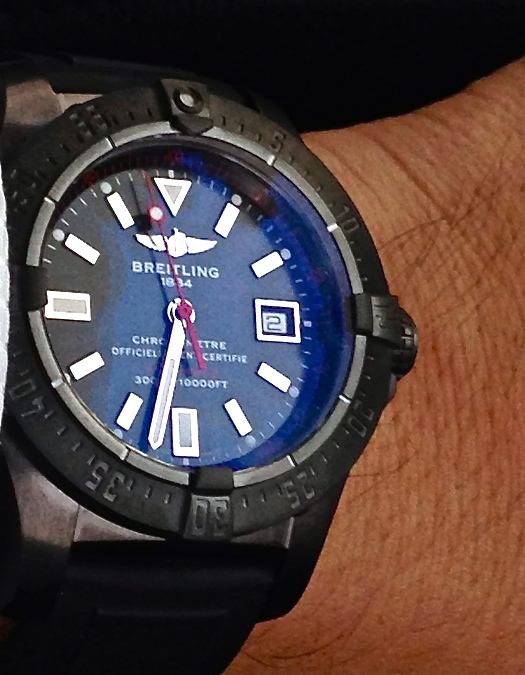 In a nutshell, I neer liked Breitling... That's until I came across the Superocean Avenger Blacksteel! Now, this beast really got my attention. I like diving watches. I like my pieces chunky, sturdy, hefty, and if possible dark and brooding. I was just visiting my regular AD to have a little catch up with him when he decided to introduce me to a certain limited edition Breitling. Mind you, the piece he showed me is not the one I'm reviewing here but very similar. He showed me Avenger Seawolf Blacksteel LE with red yellow and black combo. It's a pricier version of the one in the pic above as it's limited to 100 pieces worldwide (the one being reviewed here is limited to 1,000 pieces). The offered price was acceptable but I wanted to do a little more research on this little number. Off I went to check out another regular AD for the same piece as the first piece I saw had a rather inauspicious number. It was then that I stumbled upon the one which I finally bought. It's got a personally preferred red/ black combo dial and has a more auspicious sounding number and most importantly, is almost SGD2,000 cheaper! The Avenger Seawolf Blacksteel comes in a 45mm DLC case. The dial is complimented with polished silver stick markers that are rather chunky. There's also a chapter ring displaying minute indices with interspersed arabic numerals. The uni-directional bezel is engraved with Arabic numerals linked with engraved minute stick markes. It takes 96 turns to complete one full rotation. It also turns with reassuring low pitched ratchet-like clicks. It doesn't require much effort nor is it too tight either. Although called "blacksteel" the case is more a dark gun metal grey rather than black. It somehow reminds me of the colour of the wormhole protal in the Stargate TV series.It's powered by the Breitling 17 calibre, which is essentially, a ETA 2824-2 base. This is actually one of my preferred movements as it's a proven workhorse. As with most larger dials using this calibre, the second hand does not weep that smoothly. There's a rather obvious jerkiness. Oh, this offering is also COSC certified as well. The Lume is pretty brilliant but the lumed markers could be a lot bigger. However, the duration doest not last very long. The case back is a highly polished domed steel plate. The winged logo takes centre stage but instead of the usual text indicating the depth rating material used etc, the confirmation of the COSC certification is prominently engraved on the case back, together with the limited edition number. This chunk of dark matter sits very comfortably on my srawny little 6 3/4-inch. It's weighy but it is not uncomfortably so but then again, I'm used to heavy watches. The comfort actually lies with a rather simple and ingenious design. The lugs are heavily curved to ensure that the watch wraps around the wrist neatly. This is a rather clever design as straight lugs would make the watch seem much larger on small wrists. The Case/ DLC coating is excellently finished and very smooth. the other intelligent design is the position of the lug holes. They are set higher up in the lug arms to further ensure that the lugs do their job in wrapping the watch around the wrist comfortably and neatly. The accompanying large crown is ribbed and easy to perate. It feels insulated, cushioned of sorts. Probably due additional or thicker seals due to it's depth rating. The screw threads are concealed. The crown screws down easily in about 5 turns. This handsome creature is depth rated to 3,000m and is equipped with the quintessential HEV on the side of the case. Breitling did an amazing job with this watch. they have finally found the right formula, imho. The basically took a simple, basic design and enhanced it with a different surface finish rather than reinvent the wheel by cluttering the dial unnecessarily like they did in the past. This watch comes shod with black Diver Pro II rubber straps mated to a DLC tang buckle. However, I noticed tears around the lug areas. These were promptly replaced. The straps also had a very strong burnt rubber stench. Another problem surfaced about a week later. It was moving about 3 minutes faster daily. The service centre promptly demagnetized it for me and it has been working like, well, clockwork since. Although not actually very eye-catching, I love this watch because of it's utilitarian simplicity. In this case, plain is good! Movement : Breitling Calibre 17 (ETA 2824-2 base). Case size : 45mm w/o crown. Case material : Steel with DLC. - Less is good. Great looking simple design. - Lug design and lug holes positions. Makes it comfortable on smaller wrists. - Burnt stench from rubber straps. - Can be pricey to some. - Lume markers should be larger.